"A few years back, Lima, Peru was named the culinary capital of the western hemisphere. With such deceptively simple yet delirious delicious food, one can see why. This is my take on a traditional lamb stew called 'seco cordero.' Pisco is a Peruvian spirit made from grapes similar to but not exactly like grappa. You can substitute grappa or leave it out entirely. Goes well with white rice; excellent day-of or reheated the next. This could also be made in a slow cooker." Heat 1 tablespoon olive oil in a large oven-safe pot or Dutch oven over medium heat. Cook and stir red onion, aji pepper, garlic, cumin, salt, and black pepper in hot oil until onion begins to brown, about 10 minutes; transfer cooked onion mixture to a blender and add cilantro, beef broth, and Riesling wine. Blend the mixture into a smooth sauce, 1 to 2 minutes. Heat 1 more tablespoon olive oil in same pot over medium heat; brown lamb shanks on all sides in hot oil, about 2 minutes per side. 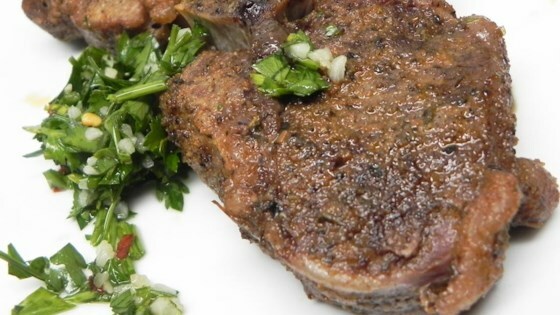 Pour cilantro sauce over lamb shanks and cover with lid. Bake in the preheated oven for 2 hours. Add potato chunks to the pot. Pour pisco over lamb and vegetables. Continue baking until lamb is very tender and sauce is slightly thickened, about 1 more hour. Remove from oven and sprinkle peas over the lamb; cover pot to let peas heat through, about 10 minutes. Let lamb shanks cool 15 minutes before serving. Less time in oven. I only needed the 2 hours for some reason.